My daughter says that I do it more than her friends’ moms do. In fact, she claims that her friend’s moms never do it. I told her that I find it very difficult to believe that her friends’ moms never yell. “Why do you think they never yell?” I ask. “Because my friends are never home?” she guesses. It’s true; her friends are almost never home. They are almost always here. I think I rarely yell. My daughter doesn’t agree. After years in the public relations business, though, I’ve learned that perception is reality. If my daughter thinks I yell all the time, then I yell all the time. The Wall Street Journal reported that researchers suspect parents are yelling more, in part because spanking is out of bounds. Not surprisingly, researchers are finding yelling hurts children. Nice of them to also be researching how to help parents stop yelling. One of the reasons parents yell is “emotional flooding,” which occurs when we see “a child’s negative emotions as unexpected, overwhelming and upsetting.” Each outburst makes us feel more threatened and frustrated. As we spiral downward in our ability to cope, we yell. I agree that yelling is a result of frustration; it’s never my first resort and always involves an escalating argument. No matter what my daughter believes, it’s my son and I who do the most yelling. And while many parents report reforming their loud mouth ways in their children’s early years, I am something of an old yeller, beginning as my son grew older. 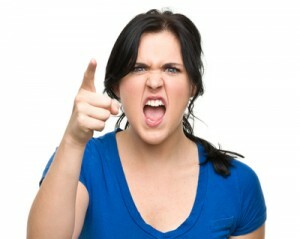 I have a friend who says that sometimes she feels justified when she yells at her children. It’s hard not to feel that my verbal power play isn’t effective when, as in the gauging incident, my son changed his mind. Was it the yelling or the logical arguments that swayed him? I’m going with the yelling. I’m convinced that his earlobes would be on their way to accommodating one of our dinner plates if the argument hadn’t gotten heated. But yelling, for me at least, is definitely a power play born, as the researchers surmise, out of frustration. I feel powerful and purged of my anger, but only for a while. Not long afterward, I feel small and kind of stupid. A better parent would have a better relationship with her son; she wouldn’t have to yell. If I need any confirmation of the power of the yell, I need only turn back to my daughter. I sound mean when I yell, she says. My yelling makes her feel bad about herself and mad at me. She thinks I yell because I’m a mad person. She’s right. I’m mad when I yell. “When do I yell the most?” I asked her. “When I whine,” she told me. Well, duh! I thought. You know exactly how your whining makes me feel and you do it anyway. In fact, you do it on purpose. Recently, though, my daughter inadvertently revealed her truth about my yelling. She allowed friends in my new office while I was away from home. In the hilarity of playing Hide and Seek, the glass of a large framed print got broken. I didn’t yell. But my daughter wished I had. “But I hate it when you’re disappointed.” She started to cry. As powerful as yelling may be, my disappointment is more powerful still. I almost felt sorry for her. So, I try not to yell. When I feel it coming on, I take a deep breath. I call on my meditation skills and repeat a mantra. I count to ten. I use the moments to try to find a logical consequence, like vacuuming up the bits of glass and paying to replace it. The research says that yelling has long term consequences and that even with contrition afterwards, the damage is still done. In fact, some say spanking is less damaging. It doesn’t matter to me; I’m going to continue trying to keep both out of my parenting repertoire. I have to yell at my three year old frequently because he doesn’t seem to pay attention to me otherwise. My teenagers, though, I rarely have to discipline or yell at. This is me, being jealous. BTW, are you going to get your kids to write poems, do drawings, or be interviewed for the July focus on kid voices??? This is the first I’ve heard about this. Where was it mentioned? It’s been mentioned in a couple of posts. I’m looking for things like the Where I’m From poem and the crayon painting that my daughter did that were posted earlier this month. Check back a post or two or three. If your kids don’t do art, you could do an interview with them about their lives, favorite things, etc. does not at all have to even mention anyone’s diagnosis. This is supposed to be fun. And no pics of the kids themselves, though their photography is welcome. When I really want my children’s attention, I force myself to be quiet. Controlling my reaction, in an emotional moment, may be the hardest, most productive manipulation. Brilliant! I whispered to my kids when they were babies and couldn’t stop crying. You have some amazing self control.